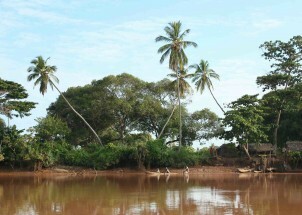 The Tana River Delta in Kenya, a vast mosaic of wetlands, grasslands and forests, was rocked by violent clashes in August between the pastrolist Orma and agriculturist Pokomo communities over access to pasture and water resources. Over 100 people lost their lives, and thousands were displaced. On 19th September 2012 Nature Kenya made a humanitarian appeal for support to families affected by the violence in Tana Delta. Leading by example, Nature Kenya staff raised Ksh. 41,500 (372 euro) within the first few days of the appeal. As of mid-November, the appeal had raised Ksh. 185,689 (1669 euro). Nature Kenya has already bought and distributed 1,000 kilograms of maize flour and 280 litres of cooking oil to 400 families living in displaced people’s camps in Dide Waride and Tarasaa. The former camp hosts pastoralists while the latter hosts agriculturists. Nature Kenya is now working with the Kenya Red Cross Society in distribution of relief in the Tana Delta and in the longer term the Red Cross and Nature Kenya will work together to promote ecological sustainability. At the same time, conservationists also have a reason to celebrate as the Tana River Delta becomes a Ramsar site. In 2008 Nature Kenya supported the Kenya Wildlife Service to jumpstart the process and in the following years Nature Kenya played a major role in creating awareness to local communities on the importance of getting the Delta into the Ramsar list. Nature Kenya is the BirdLife Partner in Kenya and has been involved in campaigns to promote the listing of the Tana Delta as a Ramsar site. In a statement from the Ramsar Convention on Wetlands secretariat, the Assistant Advisor for Africa MS. Ako Charlotte Eyong described the delta as the second most important estuarine and deltaic ecosystem in Eastern Africa, which permits diverse hydrological functions and a rich biodiversity. “This is a milestone in conservation efforts in Kenya and we are hoping that many other wetlands get listed as they provide vital environmental services”, says Ms. Serah Munguti, the Advocacy and Communication Manager at Nature Kenya.